Today, the Star Spangled Banner Commemorative Silver Dollar Coin remembers the British letter of February 21, 1777, sent to the Dutch rulers complaining about the assistance provided to the rebel colonies by the people and governor of the Dutch West Indies. Memorial presented by Sir Joseph Yorke to the States General, on the 21st February, 1777. Since the commencement of the unnatural rebellion which has broken out in the English colonies against the legal constitution of the mother country, the undersigned ambassador extraordinary and plenipotentiary of the king of Great Britain, has had frequent occasions to address himself to your high mightinesses, in the name of his master, to engage them, by all motives of national interest, of good neighborhood, of friendship, and finally, of treaties, to put a stop to the clandestine commerce which is carried on between their subjects and the rebels. If the measures which your high mightinesses have thought proper to take, had been as efficacious as your assurances have been amicable, the undersigned would not now have been under the disagreeable necessity of bringing to the cognizance of your high mightinesses, facts of the most serious nature. The king hath hitherto borne with unexampled patience the irregular conduct of your subjects, in their interested commerce at St. Eustatia, as also in America. His majesty has always flattered himself, that in giving time to your high mightinesses, to examine to the bottom this conduct, so irregular, and so insufferable, they would have taken measures necessary to repress the abuse, to restrain their subjects within bounds, and to make them respect the rights and friendship of Great Britain. The complaints which I have orders to make to their high mightinesses, are founded upon authentic documents, annexed to this memorial, where their high mightinesses will see with astonishment, and I doubt not at the same time with displeasure, that their new governor, M. Van Graaf, after having permitted an illicit commerce at St. Eustatia, hath passed his forgetfulness of his duty, to the point of conniving at the Americans in their hostile equipments, and the permitting the seizure of an English vessel by an American pirate, within cannon-shot of that island: and in aggravation to the affront given to the English nation, and to all the powers of Europe, to return from the fortress of his government, the salute of a rebel flag. In return to the amicable representations made by the president of the neighboring island of St. Christopher on these facts of notoriety, M. Van Graaf has answered in a manner the most vague and unsatisfactory, refusing to enter at all into the subject, or into an explanation of the matter with a member of his majesty’s council of St. Christopher’s, dispatched by the president for that purpose to St. Eustatia. After exhibiting the documents annexed, nothing remains with me but to add, that the king, who had read them not with less surprise than indignation, hath ordered me expressly to demand of your high mightinesses, a formal disavowal of the salute by fort Orange at St. Eustatia, to the rebel ship; the dismission and immediate recall of governor Van Graaf; and to declare further on the part of his majesty, that until that satisfaction is given, they are not to expect that his majesty will suffer himself to be amused by mere assurances, or that he will delay one instant to take such measures as he shall think due to the interests and dignity of his crown. Memorial delivered by order of the States General, to the King of Great Britain, in answer to the above memorial, By The Ambassador, Count De Welderen, March 26, 1777. Sire, It is with the most profound respect, that the undersigned envoy extraordinary and plenipotentiary of their high mightinesses, in consequence of the orders which he hath received, hath the honor to represent to your majesty, that the memorial which your ambassador hath presented to their high mightinesses on the 21st of last month, has touched them very sensibly: that they find themselves obliged to make complaint of the reproaches which are contained in it; as if their high mightinesses were to be suspected of a will and intention of amusing your majesty by amicable assurances which they have falsified by their acts: also of the menacing tone which reigns in that memorial, and appears to their high mightinesses too highly strained beyond that which is the accorded and accustomed manner, and that ought to take place between two sovereign and independent powers, and especially between two neighboring powers, which have been of so many years continuance united by the ties of good harmony and mutual friendship. Their high mightinesses trust that on all occasions, and particularly in respect to the unfortunate troubles of your majesty’s colonies in America, they have held a conduct towards your majesty, which has been expected from a good neighbor and a friendly and affectionate power. Their high mightinesses, sire, hold your majesty’s friendship in the highest estimation, and wish to do everything in their power, as far as the honor and dignity of their state will permit them to go, to cultivate it still more and more: but they cannot at the same time so far restrain themselves, as to disguise the very poignant sensation with which that memorial hath impressed them. It is alone from the motive of demonstrating to your majesty every possible regard, and to prove that their high mightinesses, will not neglect anything which may serve to investigate properly the truth of the facts from whence the complaints made to them seem to have arisen, that they have resolved to institute an inquiry in a manner the most summary, and cut off all trainings of delay. To this end their high mightinesses, passing by the ordinary and usual form in like cases, requiring a report in writing from their officers and others employed in their colonies, have already dispatched their orders to the commandant of St. Eustatia, to render himself within the republic without delay, and as soon as possible, to give the necessary information of all that has passed within the island of St. Eustatia, and that which hath come to his knowledge, relative to the American colonies and their vessels during the period of his command, and to lay his conduct touching that matter before the eyes of their high mightinesses. The undersigned is charged by his orders to bring the information of this resolution to your majesty; as also that their high mightinesses make no difficulty of disavowing in the most express manner, every act or mark of honor which may have been given by their officers, or by any of their servants, to the vessels of your majesty’s colonies of North America, or that they may give hereafter, so far as those acts or marks of honor may be of such a nature, as that any can conclude from them, that it is intended thereby, in the least degree, to recognize the independence of those colonies. The undersigned is also further charged to inform your majesty, that their high mightinesses have in consequence given their orders to their governors and councils in the West Indies, and have enjoined them afresh in the strongest terms, to observe exactly the placards and orders against the exportation of military stores to the American colonies of your majesty, and to see them executed most rigorously. The language of the memorial presented by sir Joseph Yorke, respecting the conduct of M. Van Graaf, may vie in pride and presumption with that of any public document promulgated by Louis XIV in the zenith of his power. It was framed in the first emotions of elation, occasioned by the successes of the campaign of 1776. The general effect produced in Holland by this ” provoking, arrogant, and indecent memorial,” as it was justly styled by lord Camden, so opposite, as that nobleman observed, to the spirit and tenor of the representations of the same ambassador during the prosperous administration of lord Chatham,” was to render the name of England odious through the seven provinces. 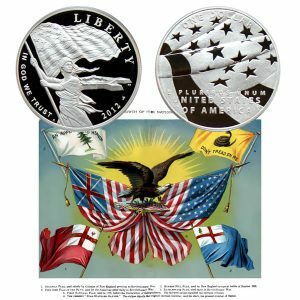 The Star Spangled Banner Commemorative Silver Dollar Coin shows with an artist’s image of flag history including the Congress flag on the left and a 45 stars and stripes on the right.